How Much Do Professional Poker Players Make? How Much Do Live Poker Pros Make? The average poker player, depending on what limit can make as little as $10,000 a year up to $1,000,000 or more per year. We’ve found that a semi-top tier live poker professional in Florida playing $5/10 NL deepstacked can make $100,000-$250,000 a year. Even playing at $2/5 NL you won’t see a drastic change as compared to $5/10. You would assume double the money, but with higher stakes comes better players. So assume you average $70 an hour at a live cash 2/5 game, you might only average $100 an hour at $5/10. These are real numbers from real pros in Florida. But, it all depends on how much work you want to put in. The amount of work you put in to making yourself a better poker player will determine how much longevity your poker career will have. The monetary side of poker is a nice thing to look at when all is said and done, but it isn’t something you should get too carried away with. If you see yourself wanting to make $20,000 per month, you should set the goal to do so, but also if things aren’t going your way it can become very detrimental to yourself and bankroll. The reason you shouldn’t look at money so much as a poker player is because you will have the confidence to have success in the long run if you are good enough. Poker is a game that is difficult at times, and very easy other times. It all depends on how you approach the game. On average, if you play low limit games over the course of a year, there is no reason you shouldn’t be able to make $50,000 each year. 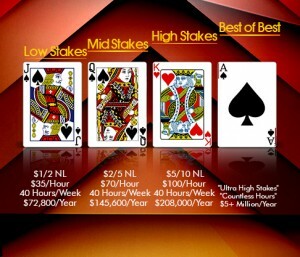 Even at the lower stakes games there is a lot of money to be made if you put in the hours. When you remove the idea of being just an average player, you will truly blossom into a good player or even a great player. Watching on television or seeing the large amounts players scoop for poker tournaments is always going to be a dream of average players and almost never a reality. It takes time like all great things, and to become a good to a great player you have to put in hours. Once you can effectively manage a poker bankroll this will determine how good you really will be. Managing a bankroll is the hardest part of poker for even the top tier players. Tons of players will get bored or carried away, or also lose the want or drive that had propelled them to the top. The drive to be the best out there is what should keep you pushing forward with your poker career. Good players can make tons of money or lose tons of money depending on how you approach the situation. If you play games outside of your bankroll or for a significant portion of your bankroll, you are in trouble in the long run. The reason is even if you win a big tournament for six figures or more, the reality is that you can still go broke if you play in games that are too high for your bankroll. What makes the difference in the top tier pros is that they manage their bankroll and also get endorsement deals to play sponsored in big poker tournaments. For the good players, you may never see big endorsement deals, so taking shots isn’t the best idea. You want to build and consistently improve your game. Most good poker player’s yearly incomes should easily exceed $50,000 and approach $100,000 or more. The reason for that is because whether you play poker tournaments, cash games, or sit and goes, you will always be a favorite to win over the table or field of players. Once you know the correct moves mathematically and have a better feel for a poker game, you will not have much trouble winning with more consistency. The biggest part of poker is to be consistent with plays, but also to adjust to your table. If your table is aggressive you play passive. If your table is passive then you play aggressive. The good players understand that doing the opposite of what your opponents want you to do is the best strategy. The high limit poker players endure some serious swings throughout their lifetimes, whether it is from heartache; going broke, or bliss; winning a big tournament there are life changing moments or years pretty consistently. Players like Tom Dwan, Patrik Antonius, and Phil Ivey are the biggest players in the world today. These guys are the best cash game players in the world today, and all of them got there by working very hard. These guys pretty easily make over $5,000,000 per year playing poker. The reason is because they are feared and they read situations exceptionally well. If you think about becoming one of these players you have to endure struggle, and hard times, trial and error periods of finding what game best suits you. Hours and years go into getting to where these guys are today. If you are just starting off, you can dream about making what they make, but it is significantly harder to get there today than it was 3, 4 or even 5 years ago. The games are tougher, the players are better and you basically need to win a big tournament to have a bankroll to work with.